The Domaine de Chevalier 2014 is a blend of 64% Cabernet Sauvignon, 6% Petit Verdot and 30% Merlot. It has a fragrant bouquet with blackberry, black plum, cigar ash and woodland scents, complex though not as intense as its white counterpart. The palate is medium-bodied with grainy, quite firm tannin that underpin a classic Domaine de Chevalier that has just the right amount of austerity at this stage. Reserved perhaps, but it is beautifully knitted together with a lovely bay leaf tinged finish. Quintessential Domaine de Chevalier...which is what we all want. 93-94 points - James SucklingJames Suckling, 27th March 2015 Very dense and beautiful with chocolate, currants and spices. Walnut and hazelnut character too. Full body, silky tannins and a long finish. Balanced and fine. Chevalier’s history is an integral part of its identity... The true birth of the estate dates back to the second half of the 19th century. Until not so long ago, the forest took up most of the western part of the Graves, where we are located. How things have changed since then! Archives from the 17th century show us that the small Domaine de Chivaley included “houses, outbuildings, gardens, grounds, vines, woods, and meadows.” The name "Chivaley", (meaning "knight" in Gascon) is believed to be linked, for an unknown reason, to the presence of the very old pilgrim trail to Santiago de Compostela which still borders the estate. “One of things that makes Chevalier unique is how it achieved fame in a relatively short time compared to the majority of Bordeaux great growths, which took several centuries to acquire a similar status… Of course, this is due to the terroir, but I would add that Domaine de Chevalier’s great chance was to have been managed by a limited number of owners, who all considered it essential to perpetuate a tradition of quality. The previous owners can be thanked for Chevalier’s present image of a famous wine at the top of its classification”. 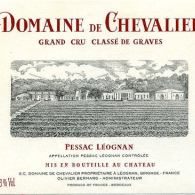 “Only three men have managed Domaine de Chevalier from time it was acquired by Arnaud and Jean Ricard in 1865 until it was purchased by my family in 1983. As for Jean Ricard, I would say that he is the true creator of Chevalier as we know it. However, his son-in-law, Gabriel Beaumartin, who was at Chevalier for forty years, was responsible for crystallising its reputation”. “Claude Ricard had been running the estate for thirty-five years when I arrived in 1983. He was much respected and had an encyclopaedic knowledge of winegrowing. Under his leadership, the estate was included among the elite grands crus in the 1953 classification of the Graves. It is also thanks to Claude Ricard that the château gained a true international dimension… We worked together for five years, which enabled me to understand Chevalier’s true nature”. Since 1983, the Bernard Family.